We harvest peat using two different methods: block cutting and vacuum harvesting (also called milled peat). Peat blocks are cut with a mechanized cutter and left on the bog to freeze over the winter. The dynamic action of freezing and thawing opens the densely compressed peat mass. The following summer, the blocks are picked up and placed in stock piles. The stock piles are covered to keep dry during the winter. From the stock piles the blocks are transported to the factory for further processing. Block peat is used in high-quality substrates for plant breeding and pot plant growing. Vacuum harvesting is a method where the upper 2-3 cm of the bog is milled, and after drying the peat is gathered by using a vacuum harvester. This method results in peat with a greater proportion of fine particles than block peat. The raw materials are transported by truck from the peat bog to the factory stock area. 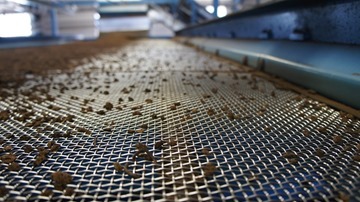 From here the different peat qualities can be collected and taken to the screening hall to be shredded and screened into many different grades. Once shredded, the peat passes over a number of "star-wheel" screens. The coarsest peat is carried over to the "cutters", where it is cut into smaller pieces. 0-20, 0-35, 5-20, 5-40, 7-12, 10-30, 20-40 and above 40 mm. For the production of substrates the required peat quality is transported to the mixing line in the next building via conveyor belts. Limestone, fertilizers and other additives are supplied automatically from computer-controlled hoppers. The Pindstrup mixing set-up is unique to the industry as we mix 1 cubic metre at a time. This ensures thorough, efficient and careful mixing that leads to uniform mixes while preserving a good structure. Peat and substrates are delivered loose in containers or in bales. In the packing hall the products may be packed into big bags, compressed 300 litre bales or loose-filled 80 litre bags. All bales are control weighed and marked with recipe number and production code. At Pindstrup, we have a long tradition of dedication to the constant refinement of the quality of our products. Our high demand for quality is ensured by a comprehensive product control. In the bog we test raw peat for dry matter, water content, pH and conductivity. At this stage we also test for weed seeds. We make screenings in the laboratory to know the distribution of particles, from the finest fraction (0-1 mm) to the coarsest fibres and lumps. Each product has its own standard in order to ensure uniform structure from one delivery to another. A samples of the substrate is put in a pot, and its ability to take up water is measured in an ebb and flood system. It is important that the substrate takes up water immediately when first irrigation is made in the nursery. Adjustment of pH with lime and addition of fertilizer is controlled by measuring pH and conductivity in each production batch as soon as the production is made. We have set standards for these characteristics for each type and screening of peat. Correct water/air ratio has significant influence on plant performance. The substrate only leaves the factory when we are sure it meets all quality standards. A production code is printed on all products in bags. With this code, we can track and trace each bag to the exact time of production. For loose substrates we print a declaration showing the production codes for traceability. Control samples of each production are stored for later use, if needed. The lab produces a control report of each production on the values mentioned above. Outturn is measured according to the European norm EN12580.